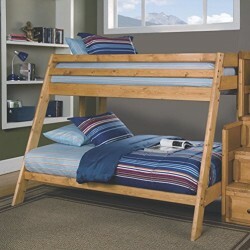 The Wrangle Hill collection includes this twin/full bunk bed that’s sure to please. The bed is crafted from solid pine for durability and beauty. Full-length guard rails on the top bunk ensure safe sleeping. Finished in amber wash, the slanted construction on the front of the bed adds flair to simple, clean lines. Optional trundle with bunkie mattress as well as slat kits are also available.